Below are listed a variety of ideas for discipline assignments designed specifically for and by art teachers. We hope these are helpful for you and your students! Please leave a comment if you have successfully used any of these ideas or if you know of more to share. We understand that there are many in our field who believe writing assignments used as a consequence for misbehavior could be harmful to the learning process. As of today, we have found no empirical evidence to prove this is true. To the contrary, after 15 years of teaching art I have found writing assignments to be effective in managing student behavior as long as they are used responsibly, especially as a reflective exercise for the student. Written assignments are also valuable as they can potentially serve as documentation for student behavior. After all, the goal is to help students. If you have ever seen any empirical research (not just opinion articles) which shows scientific evidence that written discipline assignments are harmful, please contact me. I am very interested in further reading! Thank you, and good luck! Note: you can Google "Think Sheet" and see hundreds of available examples. This is a written form designed to help students reflect on their behavior. Many teachers give these to students when they need a time-out or a break from the activity. I have assigned this form to elementary or middle school students when they were disruptive, playing with the art materials, or otherwise not behaving responsibly. It is a natural and logical consequence because the child is usually separated from the group in order to think about why his/her behavior is harmful to the learning environment. The child is also required to come up with an alternative way to respond in the future. 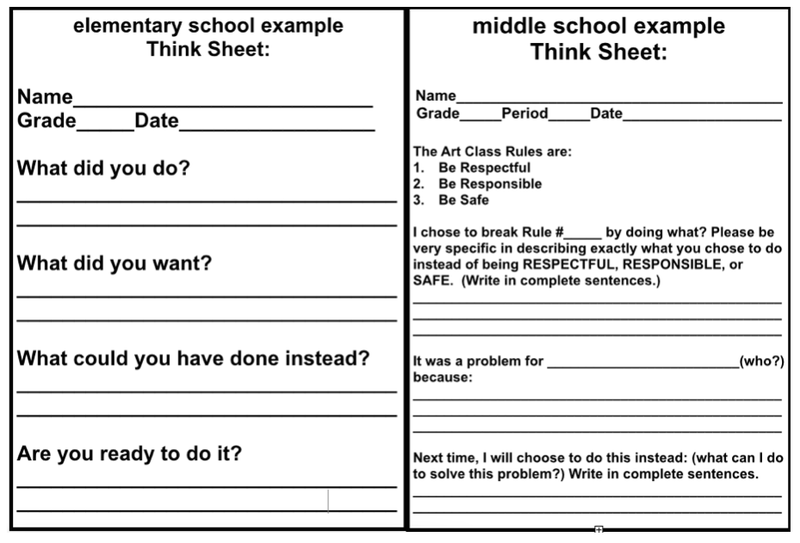 Teachers have found that the most effective way to use a Think Sheet is to have a short conversation with the student; ask him or her to tell what happened, the reason they had to write, and what better choices they could make next time. The relationship is key; kids need to know we care. Note: Think Sheets are the least controversial "writing assignment." Many art teachers who feel very strongly about the supposed detrimental effects of writing assignments have no qualms about issuing Think Sheets. They are not viewed as a "punishment," but as an opportunity for students to calm down and collect their thoughts. PBIS (Positive Behavior Interventions & Supports) is a research based, nationally recognized program that encourages this type of written reflection. Click on this link for examples of PBIS reflection sheets and click on this link for one from theartofed.com. It can be very effective and developmentally appropriate to require an older child to write a short reflective essay about the choices s/he made and what better decisions could be made in the future. This is a good way to help them exercise their vocabulary, written communication, and critical thinking skills. Writing an essay about behavior is mentioned as a logical consequence by Harry and Rosemary Wong in their highly renowned book, The First Days of School, 2001, (pages 155-156). 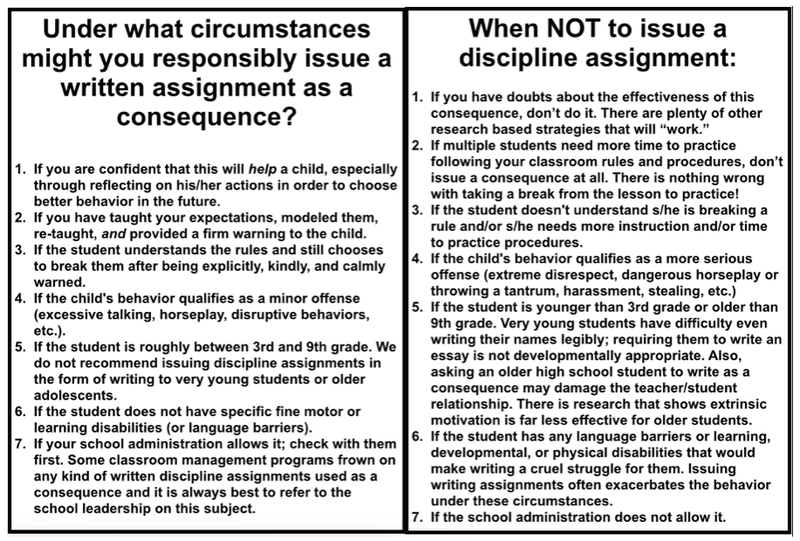 However, this particular writing assignment is a bit more controversial than the Think Sheet because of the negative connection between writing and consequences for misbehavior, i.e. "punishment." 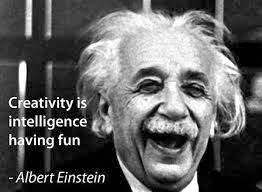 Language arts teachers would prefer their students to associate enjoyment with the art of writing, after all! Personally, I do not see much difference in a child filling out a Think Sheet and writing a Behavior Essay. It is good for children to express their thoughts, explain their point of view, and verbalize a strategy for changing the behavior. Writing these things down gives the child an opportunity to calm down and think. Occasionally I will ask a middle school student to write a one page essay about respect and responsibility. Restorative practices would also call for a written apology and a description of the cause and effect of the child's choices. 99% of the time I have assigned one of these essays the result has been better behavior. In my personal experience the Behavior Essay is even more effective than the Think Sheet. 1. Describe specifically what a responsible and respectful student does and says. 2. Describe what an irresponsible/disrespectful student does and says. 3. Describe what s/he did that was a poor choice and/or what s/he could do differently next time. 4. Write down how s/he plans to behave in my class for the rest of the year. 5. What will you do? What will you NOT do? "I had a college professor who once got mad at a student in our class, and the professor required us to write an essay at the end of every class. This was in addition to the lesson, and if you couldn't finish before class was over, you stayed until you finished. I became a great writer as a result, which is why I ultimately decided to be an English teacher." As an art teacher, this strategy has been extremely useful to me in encouraging students to make wise choices in handling art materials. Temptation abounds for kids to swing rulers or paintbrushes around in the air, or to paint pretty butterflies on their friends' hands, or slap printing ink onto a friends back, or just pour out all the paint to see what will happen. I have seen middle school students do some interesting things with paint, tools, clay, you name it! In my classroom, if students can't be trusted to use the materials safely and appropriately, they can choose instead to read about the process in the textbook and write down answers to questions at the end of the chapter. I have also required students to read and summarize a section of the text. Reading and writing about art is definitely part of the curriculum! This website has a list of extra credit art writing assignments that could be used in lieu of art materials: artsology.com, and this website has art history information for kids: Art History For Kids (ducksters.com). Also, there is an abundance of interesting articles about artists available, such as this one about Kehinde Wiley from The Atlantic. Also, this is an assignment I used to post on the dry-erase board (entitled, "ALTERNATIVE ASSIGNMENT") at the more difficult times of the year, such as before holidays or at the end of the school year. Just seeing the assignment on the board was very effective for my middle school students to be reminded to put forth their best effort to behave! Marlene Nall Johnt, in her excellent book A Retired Art Teacher Tells All, describes preparing discipline assignments for her high school students ahead of time. She kept a few ziplock bags of magazine articles she found about famous artists. The students had to read the articles, then write a one-page report that night. They had to write a 2-page report if the assignment wasn't turned in on time! Marlene's discipline plan was in place for many years, and her students loved her. She was aware of the fact that many in education frown on this type of consequence, but she understood her school community very well. She writes that this strategy was extremely effective as a deterrent for misbehavior!